Gregg Mitman. 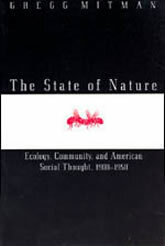 The State of Nature: Ecology, Community, and American Social Thought, 1900-1950. University of Chicago Press, 1992. Although science may claim to be “objective,” scientists cannot avoid the influence of their own values on their research. In The State of Nature, Gregg Mitman examines the relationship between issues in early twentieth-century American society and the sciences of evolution and ecology to reveal how explicit social and political concerns influenced the scientific agenda of biologists at the University of Chicago and throughout the United States during the first half of this century. Reacting against the view of nature “red in tooth and claw,” ecologists and behavioral biologists such as Warder Clyde Allee, Alfred Emerson, and their colleagues developed research programs they hoped would validate and promote an image of human society as essentially cooperative rather than competitive. Mitman argues that Allee’s religious training and pacifist convictions shaped his pioneering studies of animal communities in a way that could be generalized to denounce the view that war is in our genes.